Linda Marrinon, ‘Golden woman’, 2018. Painted plaster, 72 x 21 x 16cm. Courtesy: the artist and Roslyn Oxley9 Gallery, Sydney. Roslyn Oxley9 Gallery presents a solo exhibition of work by Linda Marrinon, following her receipt of the 2018 Don Macfarlane Prize, and the announcement of her inclusion in The National 2019. A key figure in Australian art since the 1980s, Marrinon first came to prominence for her idiosyncratic paintings and drawings that reflected the postmodern parody and feminist wit of the time. 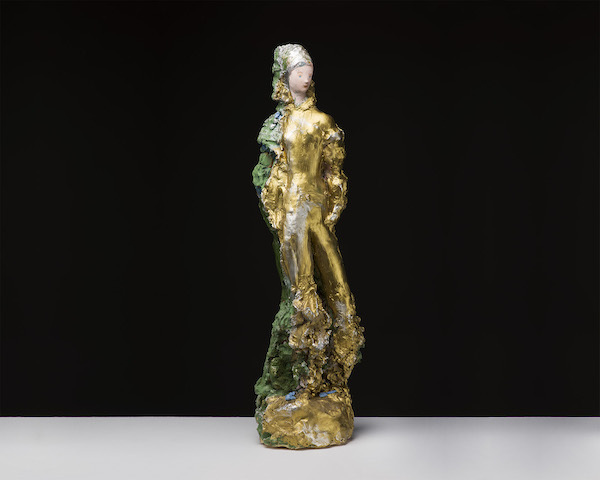 Recently she has created a compelling body of figurative sculpture and busts in terracotta, plaster and bronze, combining 19th century techniques with a contemporary sensibility. Echoing classical sculptural traditions, Marrinon subverts the genre, reinterpreting this weighty history with amusing, anti-heroic and sometimes cartoon-like simplifications, replete with contemporary reference and relevance.